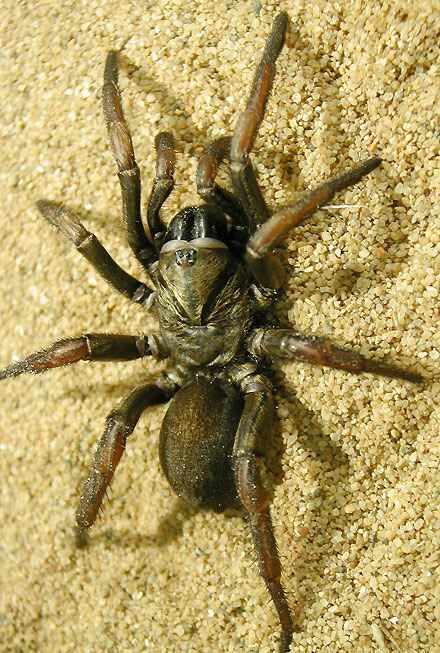 Male trapdoor spiders generally have very long thin legs and most species have a special C-shaped spine on the first leg to protect against being bitten by the female during mating. Females are large and robust. Their burrows are 30-40cm deep, often on embankments, creekbanks and other realtively moist places, the entrance being lined with leaves tied together with silk. They cannot climb smooth vertical surfaces. They occur in all habitats throughout Australia but become rare in far north Queensland and the Northern Territory.